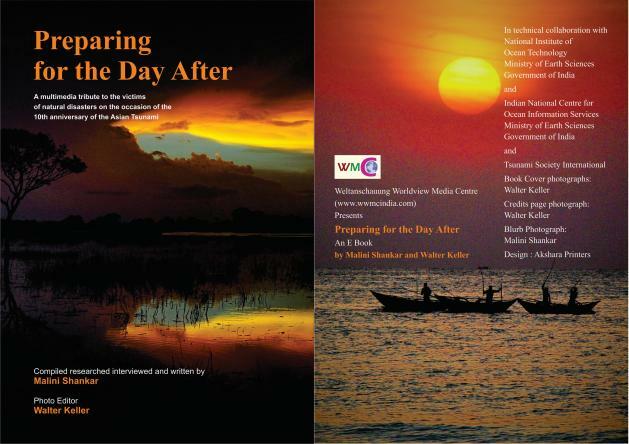 The book “Preparing For The Day After” is a photojournalistic treatise, a veritable treat for the newshound published on the eve of the 10th anniversary of the Asian Tsunami as an E Book on Google Play. Taking off on a critique on the role of the media on the day of the tsunami, the author substantiates media’s ignorance and paralysis with official U.N. reports. The E book is an authoritative analysis and compendium of the evolution of disaster management, the concept of disaster risk reduction, which evolved as a post script to humanity’s biggest recorded disaster – the Asian tsunami. Issues such as culture sensitive food security, administrative coordination, mass mortality management, impact of calamities on agriculture, livelihood, fisheries, bio diversity etc. have been authenticated with news reports, interviews, official reports, scientific perspective and pictures to make this work a credible, aesthetic, authoritative and attractive literature in a current affairs perspective. What makes it so attractive as a Picture Handbook online is its endless repertoire of referenced links to official U.N. and country reports, news media articles and visualisation with never before seen pictures and Street view graphics from Google Earth, Pacific Tsunami Warning Centre, Global Volcanism Programme of Smithsonian Institutions, NOAA, USGS, Ministry of Defence, Government of India, Swiss Avalanche Forecasting Establishment, Agencia Brazil etc. There is a credible attempt at exposing what may be either corruption, missing links, dereliction of duty or nepotism in implementing actionable inputs of early warning. Lacunae in standard operating procedures of early warning in South Asia have been exposed. The author has also articulated a geological perspective of climate change which often escapes the attention of the mainstream media. That is a very fresh breathe of air… for as the book title suggests it is not at all a doomsday prophecy rather it is a positive learning experience with vigorous illustrated documentation. In all, the book makes a veritable storehouse of well researched data on natural calamities. Evolution of best practises can have far reaching consequences on diplomacy in South Asia. A south Asian version of meals on wheels to mitigate starvation with the cultural diversity of Asiatic cuisine has an unimaginable amount of goodwill, economic and diplomatic scope. Indeed it can be a game changer. Convergence of economic and military might on the high seas for humanitarian mission? Is it naïveté or brilliance? I was unable to decide. But the compelling logic makes it a gripping read in lucid yet powerful text. Some first person accounts take the reader effortlessly to the forlorn locales like the high seas on Campbell Bay or Sunda Straits. Reading those accounts are enigmatic and addictive, the kind of books ideal during travel for lay persons and serious library referencing for trainee administrators, NGOs and disaster managers in any part of the globe, I can assure you! Besides the fund of information housed in this literature, another aspect which appeals is the rich narratives of human triumph and tragedy. Most lay persons only remember seeing visuals on TV showing the damage done by the monster waves of the Asian tsunami. Few people are able to get an inside view of the survivor’s mind, body and psyche of a tsunami survivor. The author through her interactions and interviews with a range of brave hearts who survived the trauma, has sensitively brought home the awareness of just what all entails being a survivor of a disaster of this magnitude; and the ramifications of such a disaster on human souls, which unfolds over years. There is a picture of a cat hiding from scare of a seismic event… there is a picture of a dead cow entangled in the roots of a mangrove forest. The book also serves as an awareness manual to the common man to get a sense of how delicate the balance in nature is… And just how ruthless and ferocious Mother Nature can be. A downside is the size of the E book. At 1332 pages it doesn’t make for a quick read, all of which is encapsulated in two words! – “Go Green”. But the author explained that this is because it is an E Book. Once designed for a hard copy printed edition, it should be far less, but of encyclopaedic proportions I am sure! Also the author could have treated climate change with a lot more of serious attention it calls for; although it is touched up as sub text in various chapters. Said Shankar, in an exclusive discussion with this writer “Even U.N. reports like SREX cannot be a complete and exhaustive compilation of extreme weather events; how then can one unfunded author put it together? Hence I created an online Survey seeking best practices on mitigating hydrometeorological disasters”. Looking at the alphabetical listing of hydrometeorological disasters in “Preparing For The Day After”, it is obviously a challenge to compile all HM disasters with research reports, field anecdotes, quotes, best practices, pictures, dissertation etc on a global scale in one picture handbook that too without funding by one author. With photographs sourced from Government of India, Government of Switzerland Government of Brazil, U.N. Photo Library, and another 8 photographers, the illustration is a very rich kaleidoscope of Disaster Management issues. The graphic images of mass graves, mass mortalities have been handled with sensitivity and cannot be called sensational. The book’s photojournalistic value comes out perfectly synchronous to the copious text. Illustration and text both justify the portraiture of disaster management issues. All in all, an informative and interesting read, needs editing though if it needs to reach the unconverted clichéd “illiterate vulnerable communities”. However the critical significance of the book justifies multilingual editions for a global reach. It’s a shame that a work of this genre lacked funding and had to compromise on research or printing costs. Google Play Books has universal reach no doubt but its technical accessibility can be challenging, denying the critical reach of the work to the ones to whom it matters the most.